Tiger Bill's review of Aaron Spears DVD Beyond the Chops from Hudson Music. 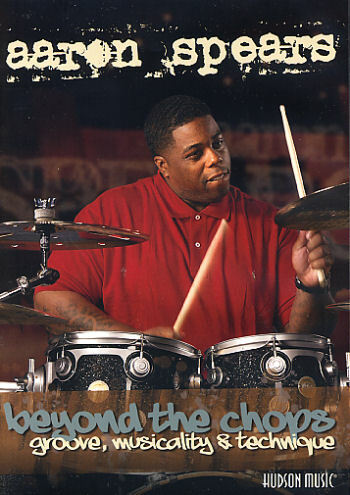 Aaron Spears, drummer with the American Idol Tour and R&B artist Usher, offers both performances and educational segments on this DVD, which includes an interview by Jojo Mayer. Disc One: Master Class - In front of a group of students, Aaron performs a song in each of the following styles along with a discussion of the techniques involved in performing each one in an authentic manner: Gospel, Shuffle, Motown, Hip-Hop, Rock, and Odd Time. Disc Two: Mainly consists of an Interview with Aaron Spears by Jojo Mayer. The first part covers Concepts and Background while in the second part, Jojo gets Aaron behind the drumset and asks him to demonstrate everything from his concept of grooving while playing with the greats on stage under pressure to fills to developing a sense of time to conceiving ideas to Aarons's practice methods, dynamics, modern beats, technique, and soloing. Aaron Spears, along with some help from interviewer JoJo Mayer, provides us not only with a look into his own drumming career path but some valuable insights into many of the concepts that are being used by drummers who are on the forefront of today's music scene. The information provided on this DVD can be of help to any serious drummer looking to gain and maintain a gig in today's professional arena. In addition to the 2-disc DVD, you get access to a PDF e-book that contains written notation covering many of Aaron's grooves as performed on the video. While a good value at a retail price of $39.95, this DVD set is available online at a discount. Click on the link in the right-column sidebar for details.